Recipe by Eva Alkasov of Love&Grub. In a saucepan, combine frozen wild blueberries, sugar and water on medium heat. Stir and simmer until the blueberries start to breakdown, the sugar dissolves and the sauce begins to thicken. Add a few drops of the syrup to the feta, place in a oven safe dish and bake for 20-25 minutes until the cheese softens and starts to brown. 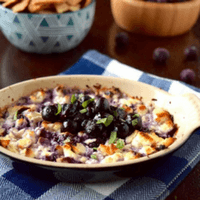 Remove from oven and top with the blueberry compote.